Spotify’s recent announcement was an interesting one to read; I assume (correctly or not) that they wouldn’t make this change unless it was the only reason they could stay in business, and that the advertising just wasn’t supporting them as much as they hoped it would. Aside from the huge sense of entitlement towards being able to get stuff for free, this is odd because Spotify have managed to get students to pay for something online. For those who may not understand the gravity of that statement, the phrase “blood from a stone” comes to mind. University students–at least in the UK–are not particularly accustomed to handing out money all over the place, especially in the form of regular, monthly payments. Spotify is the only business I can think of that has had phenomenal success and gained millions of users by providing a free service, and moved entirely to a paid model. And they’ve set the price so low that affording it isn’t an issue for a large number of young people. There’s been a slew of new businesses setting up with no way to make money to be seen (Twitter, of course, is the best known offender). But Spotify have apparently cracked it. They’ve made something that people rely on so much that, once it was taken away, a load of people felt the need to pay. @Richard28Wood Bloody spotify.. I might buy it at some point. How’s revision going? 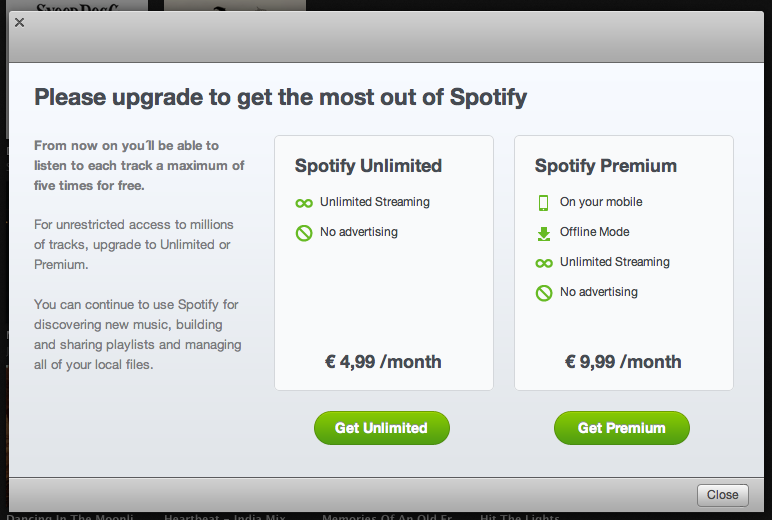 Just upgraded to Spotify unlimited, byebye adverts and time-limits, byebye £5 a month. There’s a lot of anger out there from people who feel like Spotify owe them something, but I’d nevertheless love to see a graph of free/paid conversions for today. I don’t think they’ve done too badly.